Love The Holidays? The Philippines Celebrates 4 Months Of Christmas Mania Counting down from September, nine days of Mass, heaps of roast pig, colorful lights and festivities all over the place — the Filipinos know how to make the season bright, and eternal. 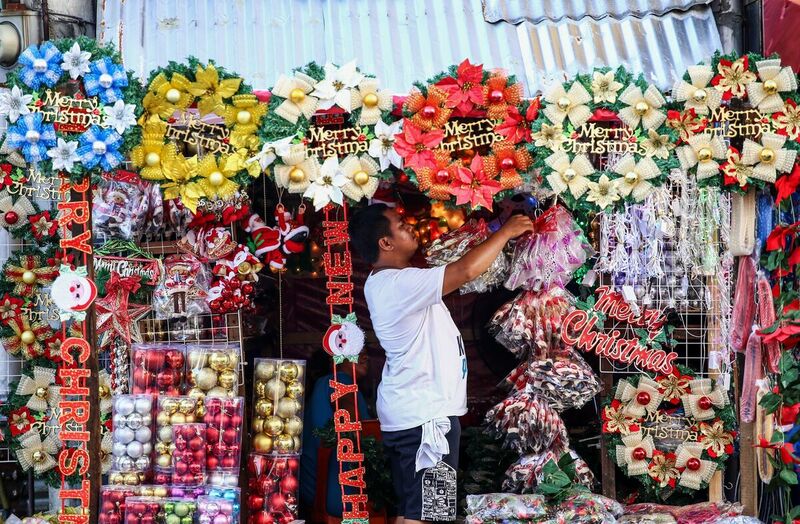 A worker arranges Christmas decorations from a street stall in Manila on Sept. 23. 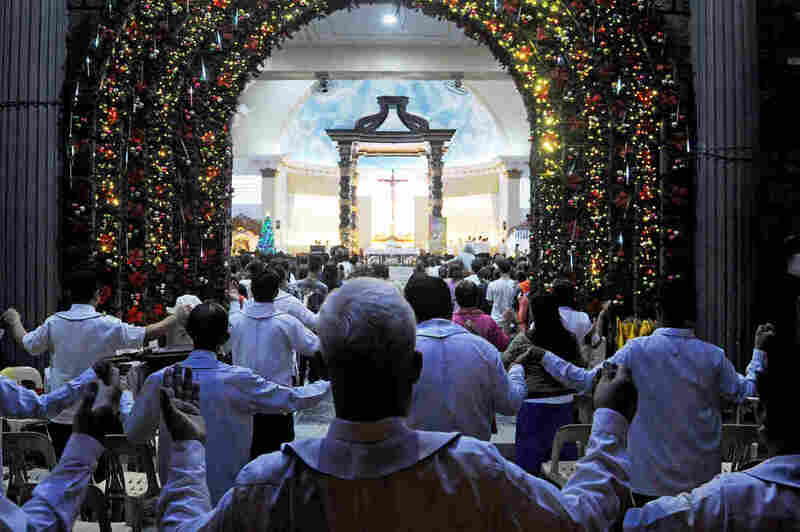 The Philippines, which has the largest Christian population in Asia, celebrates Christmas season for several months. The Philippines boasts the longest yuletide season in the world. September inaugurates the start of what is known as the "Ber" months (September, October, November and December) when parades, parties and concerts crowd the calendar of a season that is as visually resplendent as it is long. 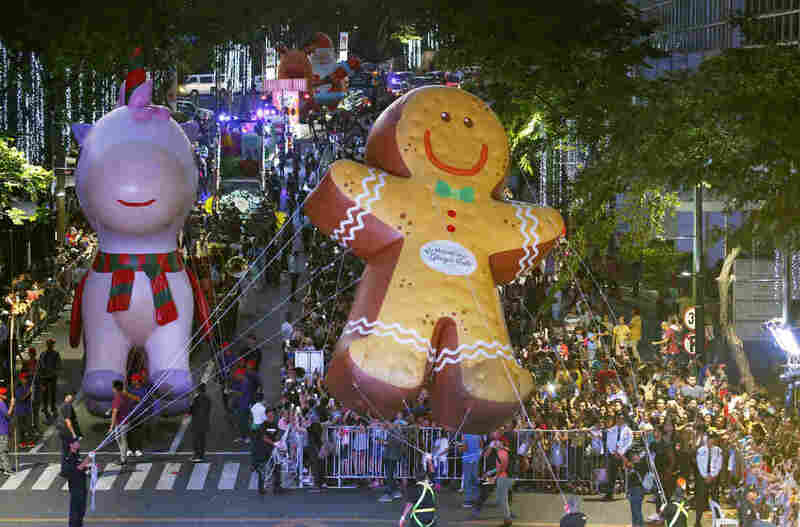 Christmas parades boom through neighborhoods and villages of Manila. A wonderland of fairy lights lines the streets. Grand hotels glisten with extravagant decorations worthy of a czar's winter palace. On Manila's Policarpio Street, lavishly lit homes draw carolers and onlookers alike. 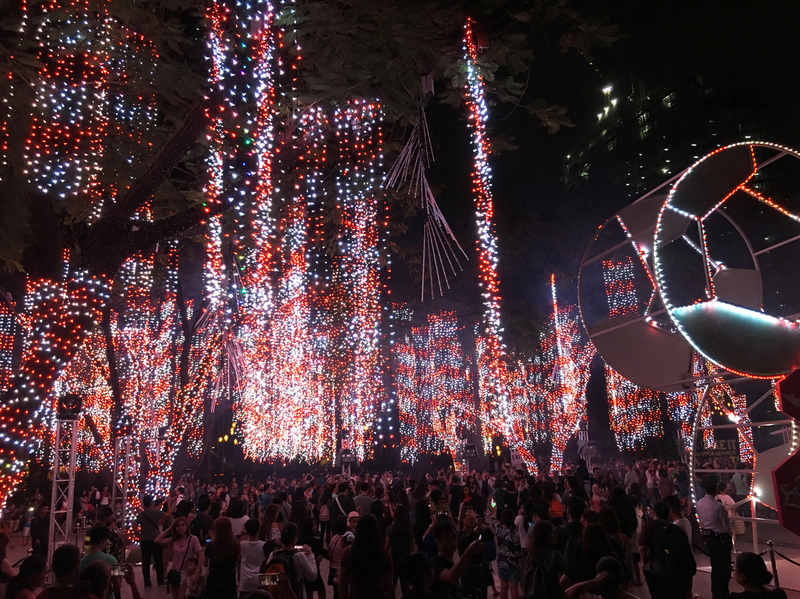 The colorful light show attracts tens of thousands to one of Manila's signature highlights this holiday season. "Filipinos love to celebrate ... and they want the environment to be colorful," says 21-year-old marketing student Pau Escobedo. Churches are wreathed in Christmas splendor, displaying life-size nativity scenes. More than 90 percent of the Philippines identify as Christian, the majority of them Roman Catholic, and consider faith central to their lives. Making the season merry, musicians and performing artists are booked in every conceivable venue, says Martin Lopez, who promotes and showcases classically trained Filipino talent throughout the season. Hundreds of residents watch as colorful floats and larger-than-life balloons, including the "Happy Pink Unicorn" and the "Giant Ginger Bread," are paraded ahead of the Christmas celebration at a shopping area in greater Manila, Philippines, on Dec. 8. But the real stars of the Christmas season appear to be the Filipino overseas workers. With 2.3 million Filipinos employed abroad, sending back a combined $31.3 billion in remittances last year, many make their one annual sojourn home for Christmas. These ex-pats even have an unofficial Christmas anthem: A ballad titled Sa Araw Ng Pasko ("On the Day of Christmas") about longing for home around the holidays fast became associated with Philippine migrant workers, remaining a classic 21 years after its release. Sociologist Clifford Sorita, a former seminarian with the order of the Society of the Divine Word, says the frenzy surrounding the "Ber" months is bound up in the anticipation of the arrival of the overseas workers. "This is really a big homecoming," he says. Sorita also says the "Ber" months represent "a psychological time clock for most Filipinos to prepare" a jammed Christmas calendar with family and friends. Tending to her shoe stall at a sprawling Christmas bazaar in Manila, Katherine Mercado, 37, says the "Bers" help focus the mind at a time of distractions. "Come September, we remember the people we value for the upcoming Christmas," she says. Filipinos pose for souvenir shots at the "Christmas House" owned by businessman Alexander Cruz in suburban Cainta, Rizal province, Philippines, on Dec. 12, 2017. The whole house, decorated with hundreds of thousands of LED lights, has attracted local and foreign tourists. There's no precise timeline on when the "Ber" tradition began. Sorita says it grew organically. 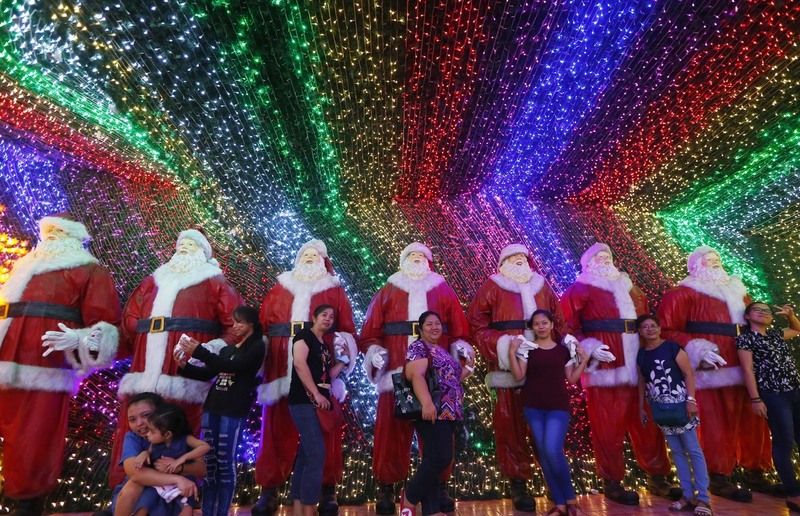 Wilfrido Arcilla, a marketing consultant who teaches at Manila's Ateneo Graduate School of Business, says the Philippines' long run-up to Christmas is not "some grand design like Black Friday," meant to entice crowds into the malls to spend. Instead, Arcilla says, the "Ber" season is a natural confluence of things that define Filipino culture: "The celebration of family and faith, fiesta and food, friends and fun." He says merchandisers are merely exploiting a Filipino passion for Christmas that predates shopping malls. The Rev. Fr. Flavie Villanueva of Manila's National Shrine of the Sacred Heart says growing commercialism is a distinct aspect of the Filipino Christmas. But rather than "antagonize the faithful" by saying "No, no, no," he says the church is there to "complement" consumerism by reminding people of the spiritual significance of the season, and "liberate them from the enslaving thought that Christmas is mainly about buying gifts [and] partying." Colorful lights outline the doorway of a Roman Catholic church as Filipinos attend the first of nine dawn Masses, signaling the official start of the Christmas season in suburban Manila on Dec. 16, 2015. Mass is celebrated over nine-consecutive days until Christmas Eve. If Misa de Gallo (Rooster's Mass) is any indication, the church is holding its own. Millions rise before dawn this season to attend the Mass, a holdover from the Spaniards who ruled the Philippines for more than 300 years until 1898. The Masses are celebrated over nine-consecutive days — the novena — from Dec. 16-24. Villanueva says the ritual originated as dispensation for farmers who rose early to avoid the day's extreme heat; in the rest of the Hispanic world, the novena was at night. Today, Filipino parishioners also fill the pews for Simbang Gabi, which means Night Mass in the Philippines' Tagalog language. The faithful endure the early hour because they believe that "when they complete these nine days ... their wishes would come true," Christianne Bituin, a 36-year-old new mother, says of Misa de Gallo. 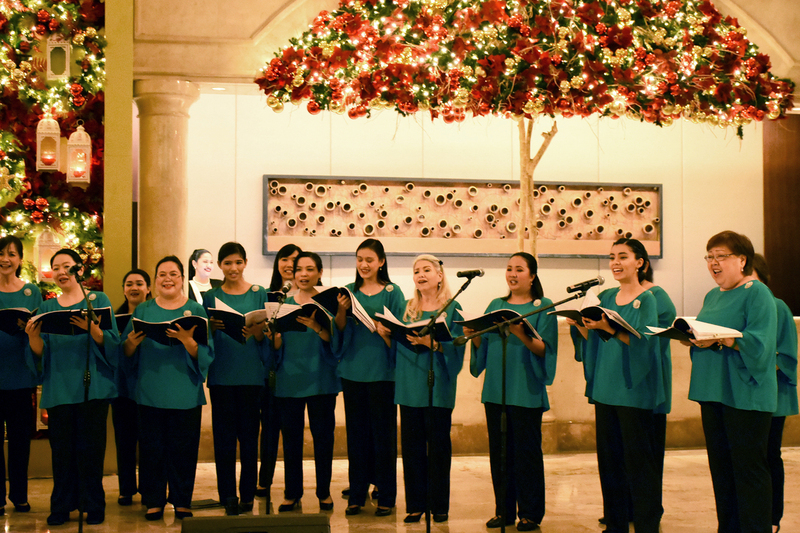 Mary the Queen Parish Church Choir performs in Manila's Peninsula Hotel. Musicians and performing artists of all kinds stage programs in hundreds of venues in the capital during the Christmas season. Villanueva says people "broaden their faith according to their own understanding and lifestyle." Carolyn Cheng, 60, has directed the choir at Manila's Mary the Queen Parish for 30 years. She calls Misa de Gallo "an expression of devotion" that helps "build anticipation of the feast." The die-hards "go straight from parties to mass," she laughs. After all the food for the soul, there's some serious feasting. No Filipino Christmas table is complete without roasted pig, or lechon, the whole pig, which can weigh between 26 and 44 pounds. Rows of roasted pigs — run through with thick bamboo sticks — line the sidewalks of La Loma, a district in Quezon City considered the lechon capital of the Philippines. At the Mang Tomas Native Lechon stall, workers take small blowtorches to the tough rinds, to burn off hair stubble. Jesus Robles torches the remaining hair off roasted pigs. Lechon, or roasted pig, is a regular fare at Philippine festivities, especially during Christmas and New Year celebrations. 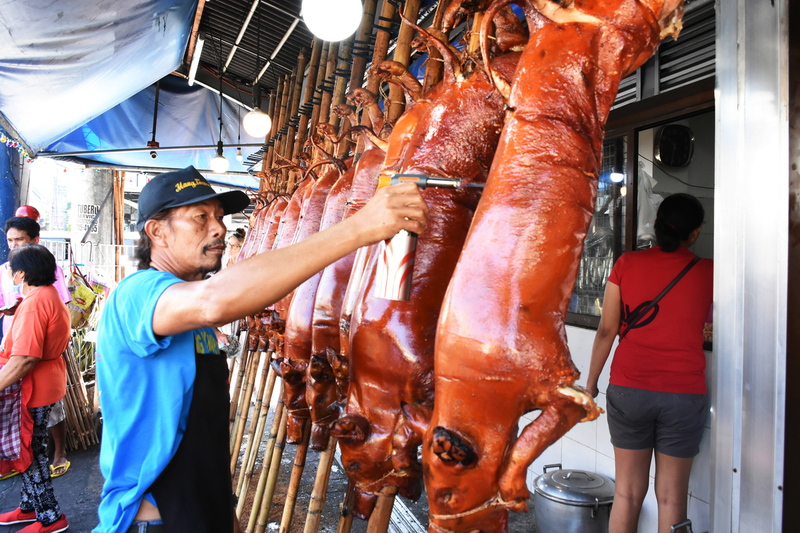 Ariel De Los Reyes, the third-generation lechonero of this family business, says during the Christmas season they sell nearly 200 pigs a day, for about $150 a piece. Heads go for $50, and there's a run on them for centerpieces. While pigs may have an honored place at many Filipino Christmas dinners, proprietor De Los Reyes says his family would "rather go to sleep than eat" on Dec. 25. "We're so tired. All those customers," he jokes. By the time Christmas comes around, this family of pig roasters wants nothing to do with the lechon many of their fellow countrymen are savoring with friends and relatives. "We eat hot dogs, ham and hot cocoa," De Los Reyes laughs. To be with loved ones is the No. 1 wish most Filipinos express for Christmas. When asked what he wanted, Michael Liwanag, a financial strategist, blurted out "world peace," and quickly amended that — just "peace and quiet." In the audio of this story, as in a previous Web version, we incorrectly say the Philippines was the only Catholic-majority country in Asia.